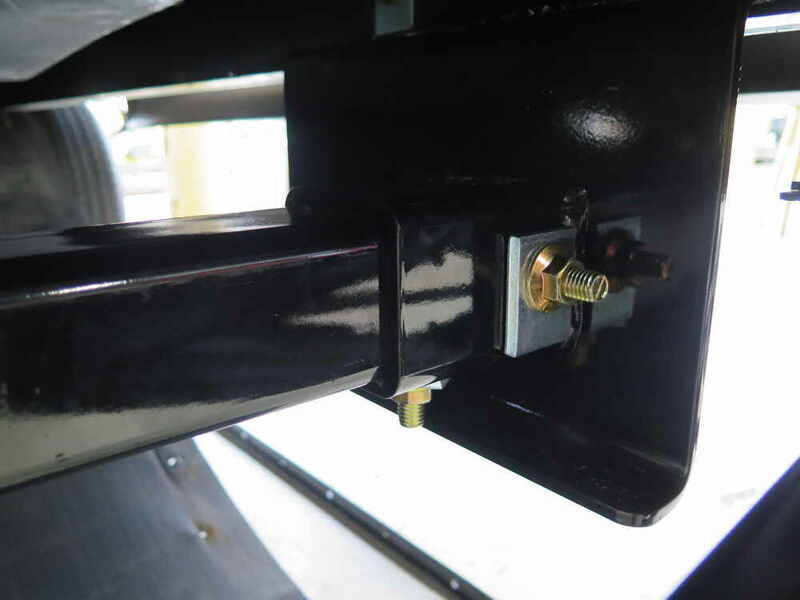 Adjustable trailer receiver hitch designed for use on RVs can be bolted to the vehicle frame or welded on for a no-drill application. Powder coated steel is sturdy and corrosion resistant. 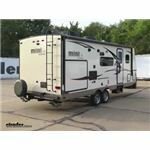 Lowest Prices for the best rv and camper hitch from Curt. 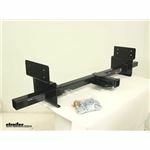 Adjustable Width Trailer Hitch Receiver for RVs, 22" to 72" Wide part number 13703 can be ordered online at etrailer.com or call 800-298-8924 for expert service. 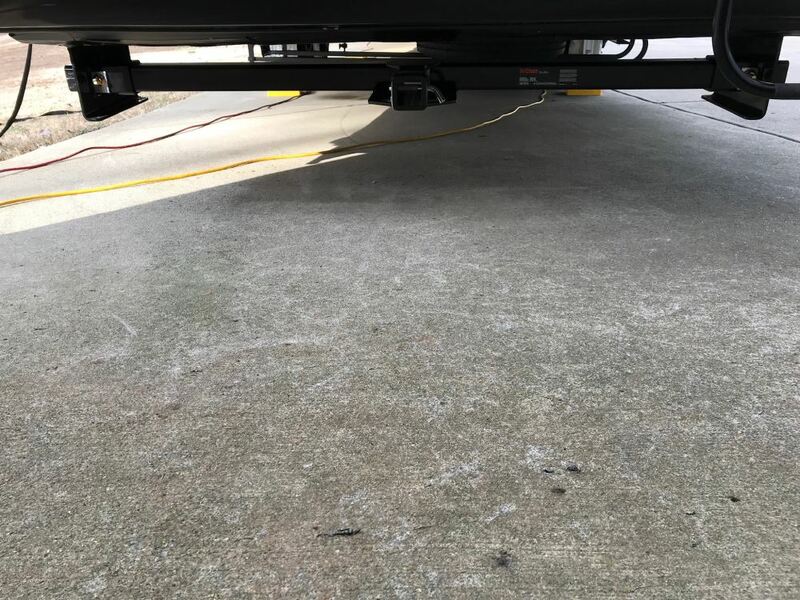 Distance from center of hitch pin hole to end of receiver tube: 2-1/2"
Today we're going to be taking a look at the Curt Adjustable Width Trailer Hitch Receiver for RVs. 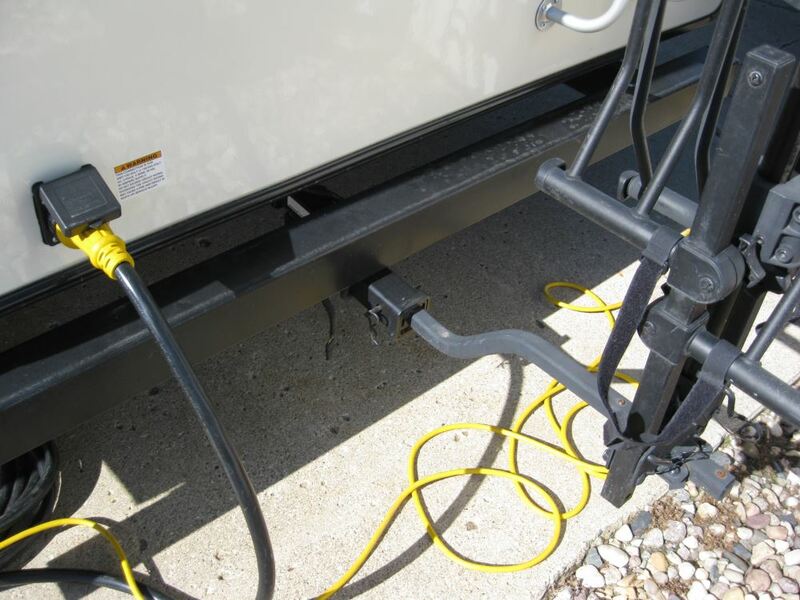 Now, this universal hitch is designed for use on RVs and motor homes. 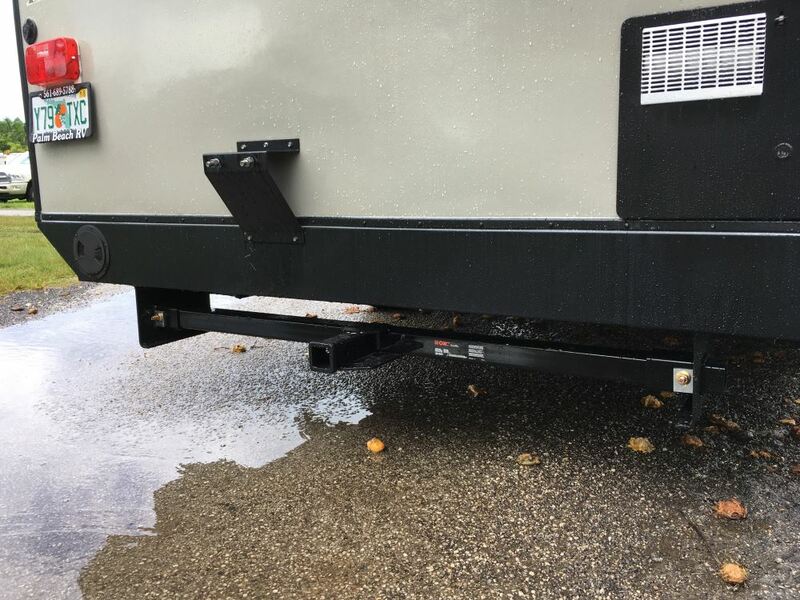 It gives you a 2 inch by 2 inch receiver opening, so it's going to be great for hauling your RV approved accessories such as bike racks, hitch mounted cargo carriers and other similar accessories as well, as well as for towing. 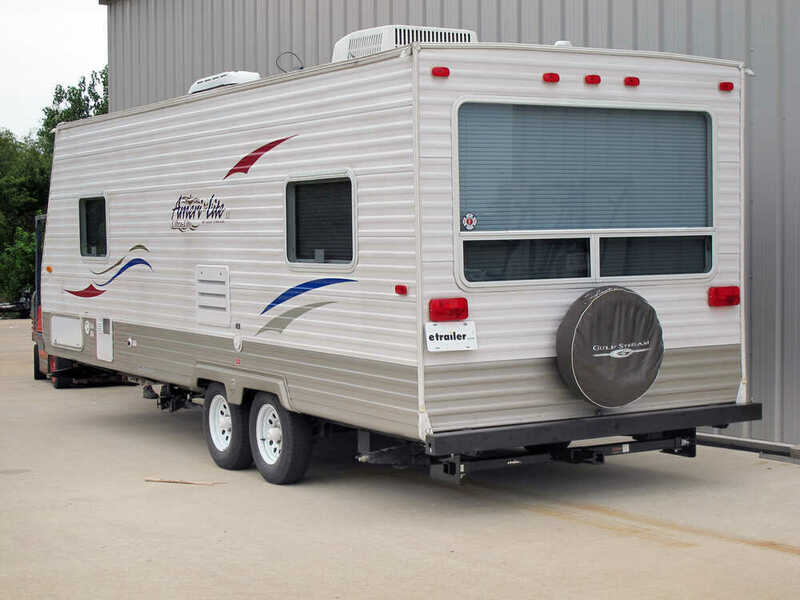 When it comes to the maximum gross trailer weight rating that's going to be 3,500 pounds with a maximum tongue weight capacity of 350 pounds. Please note that this unit is not approved and not designed for weight distribution systems. It does feature these heavy-duty side brackets. These are going to allow for a maximum adjustability, so you can see here that these side brackets slide along that main body tube. That way you can set it to the width that you need. It's going to feature your pre-drilled holes. 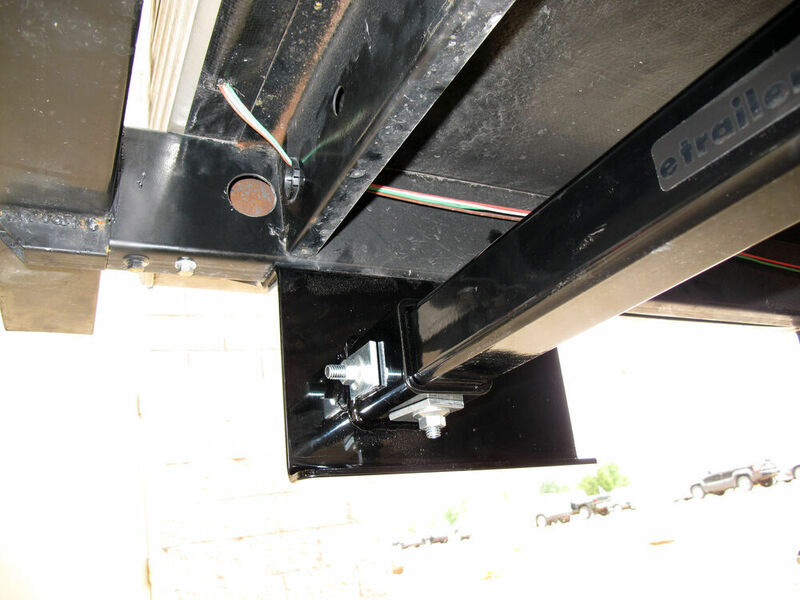 That way you can easily get that bracket secured to the main body whenever you find the width that you need for your application. It's going to come with all the necessary installation hardware, and the hardware to get the bracket secured to the main body tube. 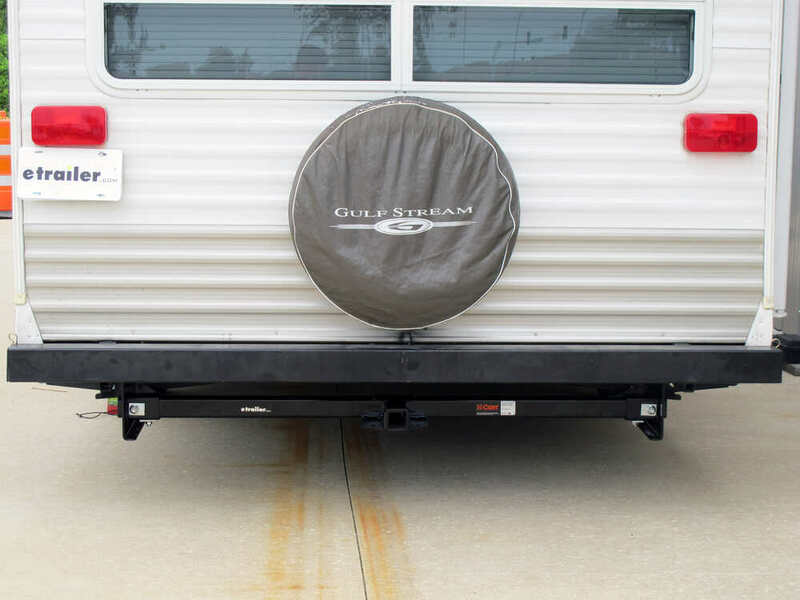 That way it's steady and secure when you're ready to install it on your RV, motor home, or camper. The unit's made from a sturdy steel construction. It's going to feature a black powder coated finish which is very durable. It's going to last a long time. It's going to resist rust and corrosion, ensuring that the unit doesn't get harmed by the elements. It's going to resist sun damage so it's not going to fade. It's just going to look good for a really long time. Now, when it comes to the minimum frame width that this can accommodate, that's going to be 22 inches. 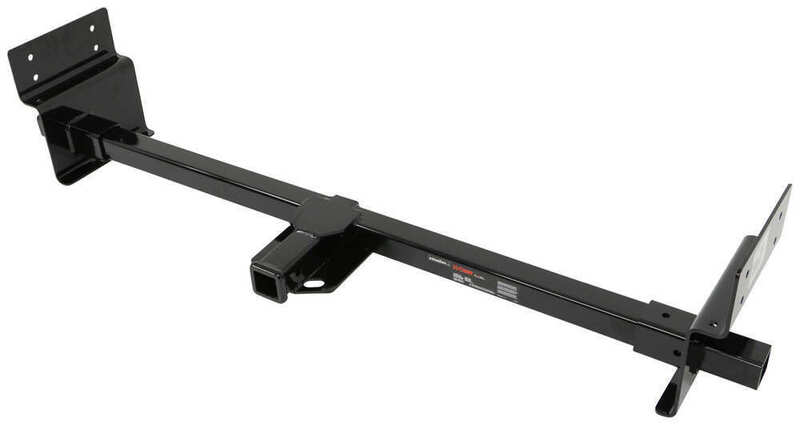 Maximum frame width is up to 72 inches, so this will work for any width between 22 inches all the way out to 72 inches, so it's a very versatile universal hitch. It's designed to work on box frame, C channel frame, or I beam frame applications. 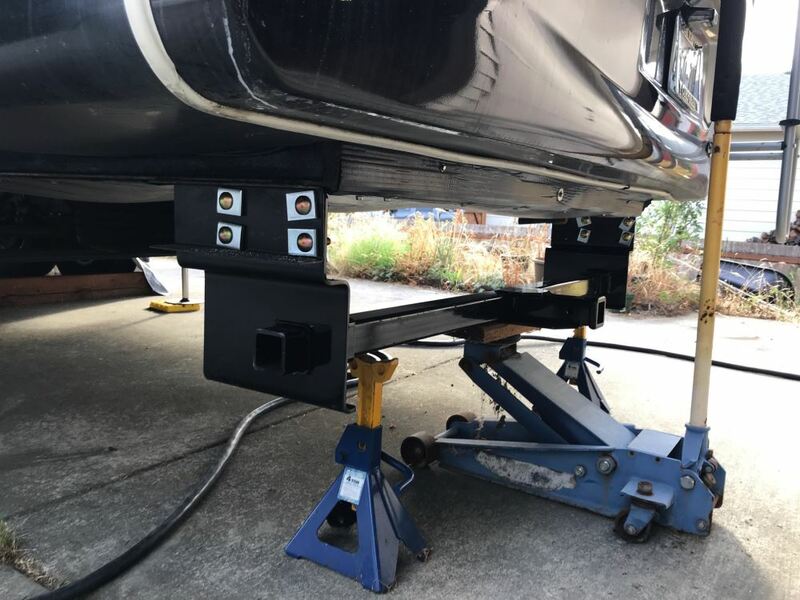 Another neat feature about the unit is you can actually, if you have enough room at the mounting location you can actually position the tube mounts toward the front or rear, which for your application is going to put the hitch body in the best location for the clearance that you need. 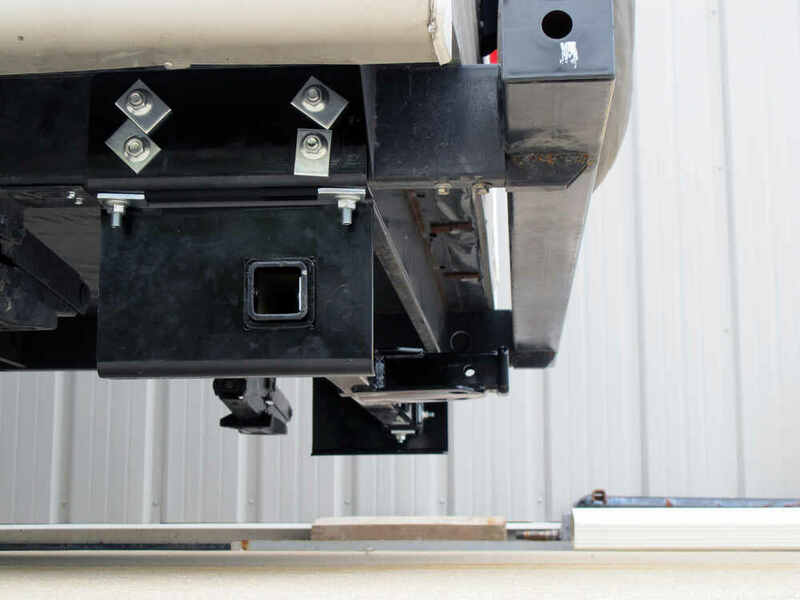 The unit features strong, secure all frame attachment, so that paired with the solid steel construction really helps it increase strength and overall safety. Again, your receiver tube opening measures 2 inches by 2 inches. You're going to have a 2 1/2 inch measurement from the center of the hitch pin hole to the opening of the receiver tube. It's got that nice rolled collar right there that goes around, but it does have a flush opening. Your pin hole diameter is 5/8 of an inch. 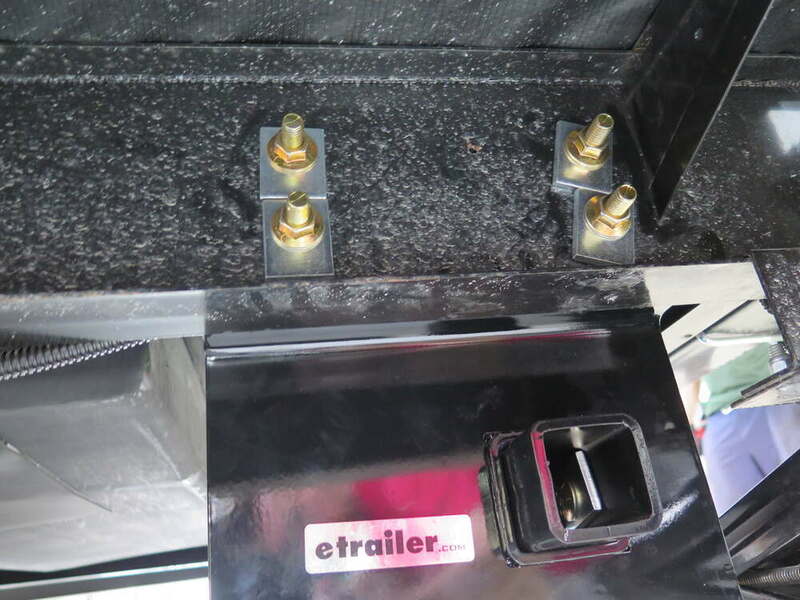 Hitch pin and clip or hitch lock, those items are sold separately, so if you're in need of those you can find them here at etrailer.com. It's also got the safety chain loop brackets welded on there. Those holes right here, one located on each side for your safety chain connections, they measure 1 inch front to back, 1 5/8 inch side to side. It's going to feature a class III rating. The bracket thickness for the side plates and for the safety chain loops, that's a 1/4 inch thick steel. 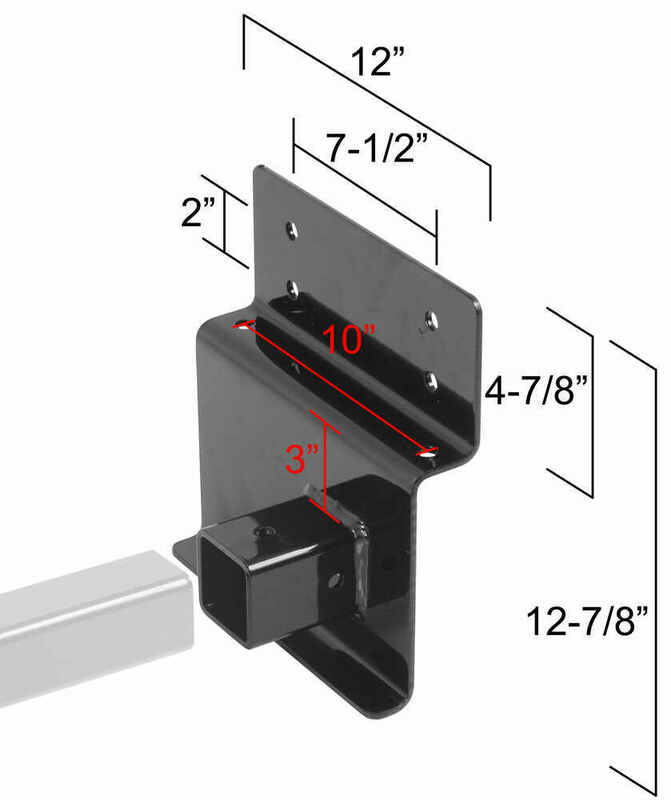 I do want to spend some time just going over the measurements here of these brackets. You're going to notice that on these brackets we have four holes. Also, there's going to be two holes, one right here and one right here, so you would attach coming up that way as well. I just want to give you the measurements of those real quick. The actual bracket has an overall width measurement of about 12 inches. From very bottom to very top measured about 12 7/8 of an inch, and the mounting area right here has a height measurement of about 4 7/8 of an inch. The mounting holes up and down are separated on center by 2 inches, and then side to side separated on center by 7 1/2 inches. Then these holes here that I pointed out, center on center, those are separated on center by about 10 inches. 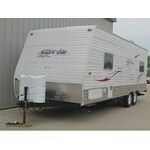 The unit is covered with a limited lifetime warranty. 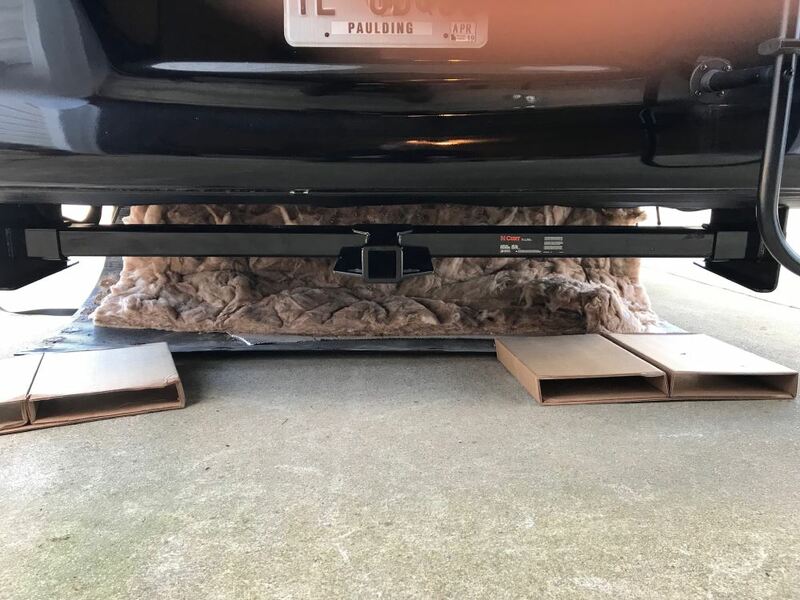 Now, you need to be aware that all non-trailer loads like bike racks and cargo carriers that are applied to this product must be supported by auxiliary stabilizing straps, which are going to be sold separately. The main hitch body tube can be trimmed, so this can be cut. That way that the ends are flush with the frame brackets. After trimming you want to be sure to coat the bare metal with paint, that way it's protected against rust and corrosion. 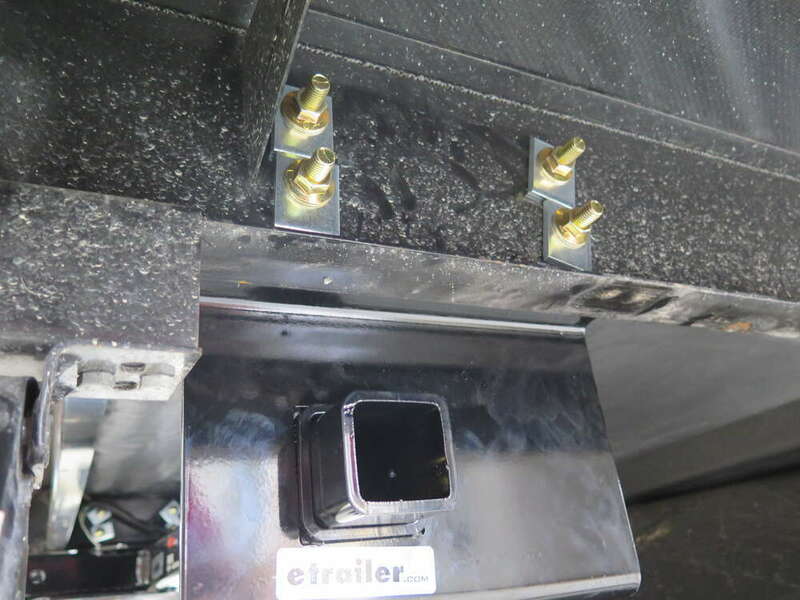 Again, all the necessary installation hardware is included, but if you want to weld this on just keep in mind that all welding surfaces must be cleaned to bare metal. 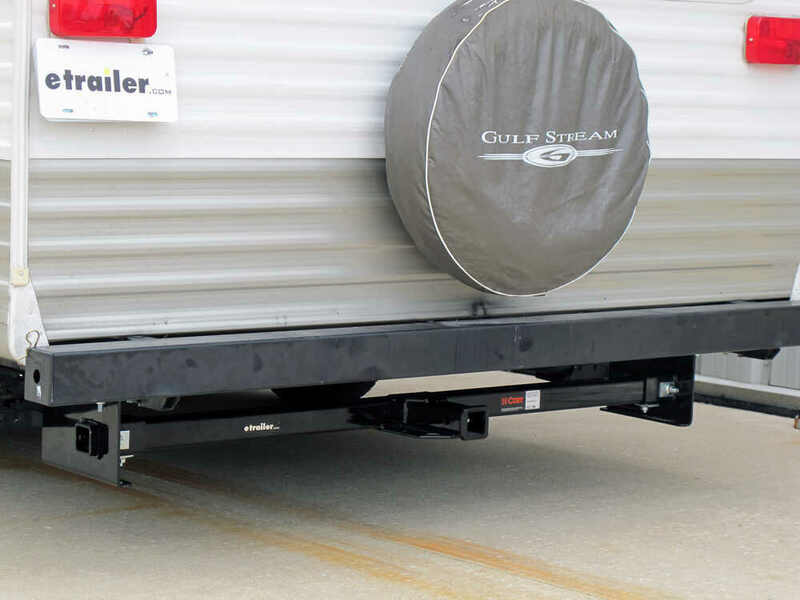 That's going to do it for today's look at the Curt Adjustable Width Trailer Hitch for RVs. Excellant. 10000 miles towing a jeep with no problems. Highly recommend this product. 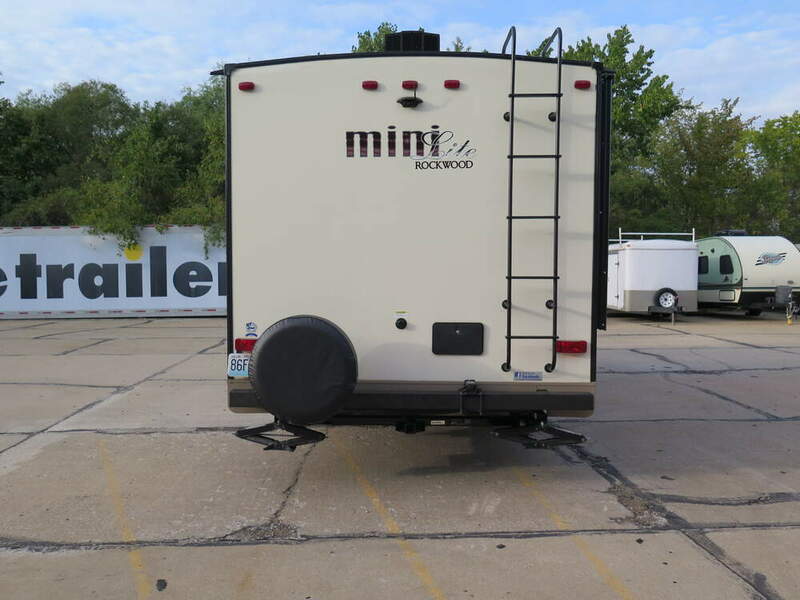 Hello PaulI also happen to have a Jayco 243 RKS 5er. Mine is a 1998. 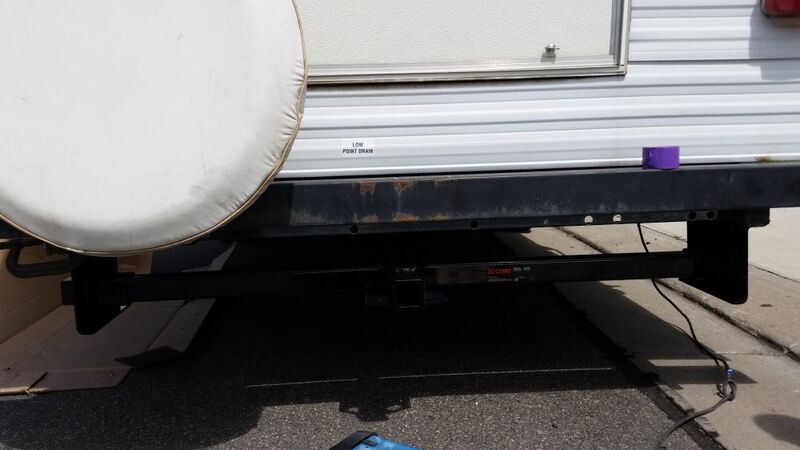 My water tank is located at rear of trailer.I am concerned that the water tank would pose a problem for install. 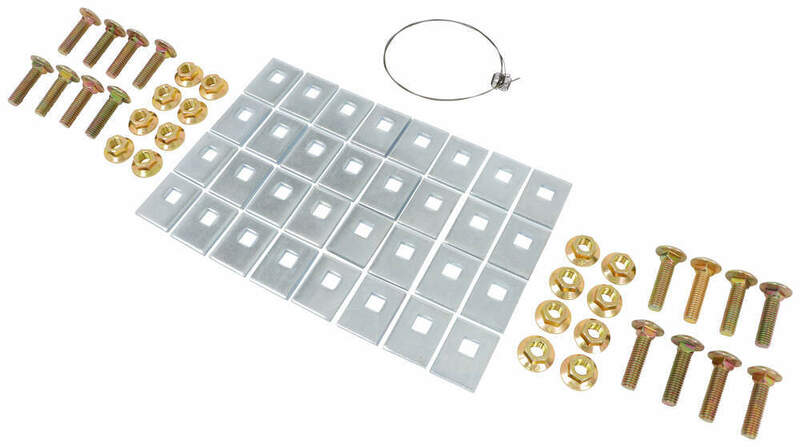 Since the frame a is a box style, wouldnt the bolts have to be 3-4 long to pass through box frame? Do you have any pics and suggestions on the install? If you could email me some pics or post them to your post that would be much appreciated.Thanks!!! 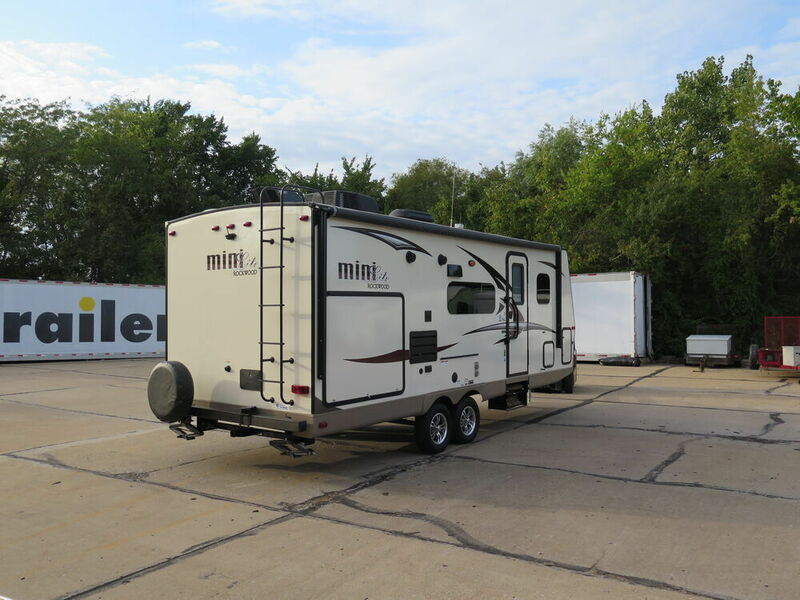 Although its designed to be used on a RV, the Curt 13703 can be used on your Ram, as long as you observe the 3500 lb towing/350 lb tongue weight capacity. 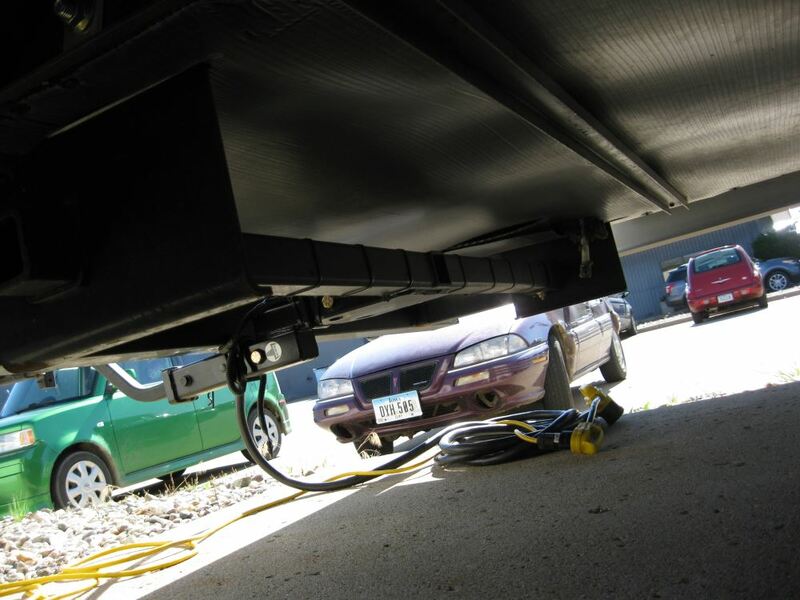 Keep in mind that using a hitch extender will lower the capacity of the hitch by half. 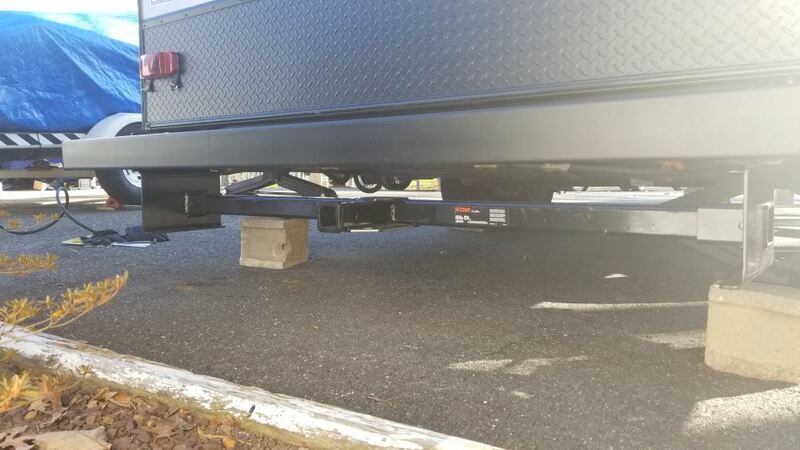 Its been a year since I installed this hitch. Ive pulled my boat several times with no issues. Great hitch and also - NO RUST. 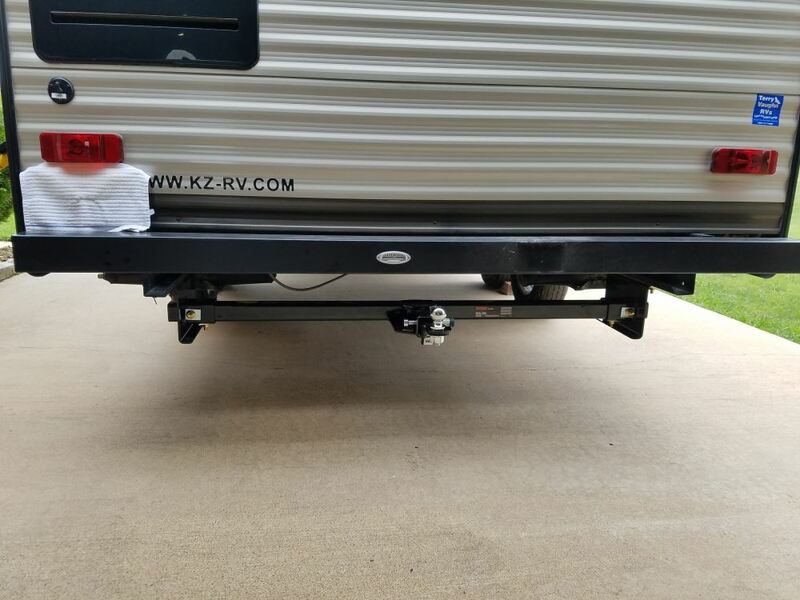 I have hauled my carrier attached to my camper several times with this hitch and it is perfect. Love the quality and its ridgidity. 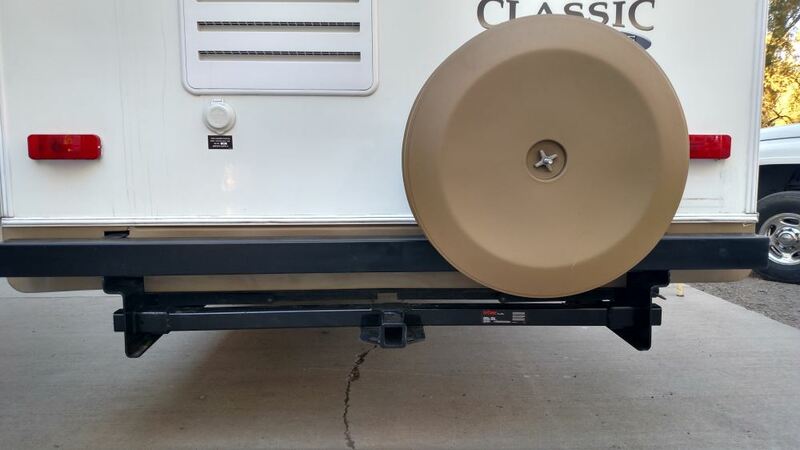 I mounted it on my 2015 Jayco and it looks like it came on it from the factory. 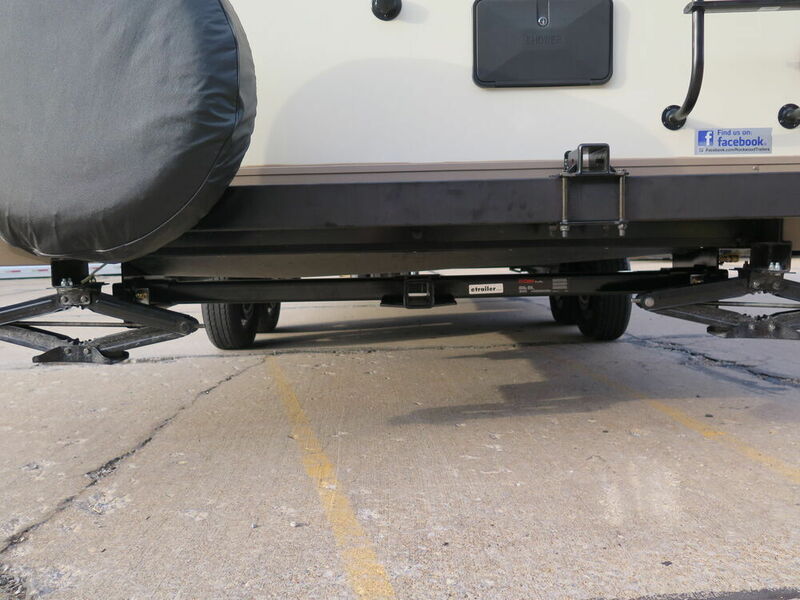 This hitch has a 350 lb tongue weight capacity, which means that the weight of the bike plus the carrier should not exceed 350 lbs. 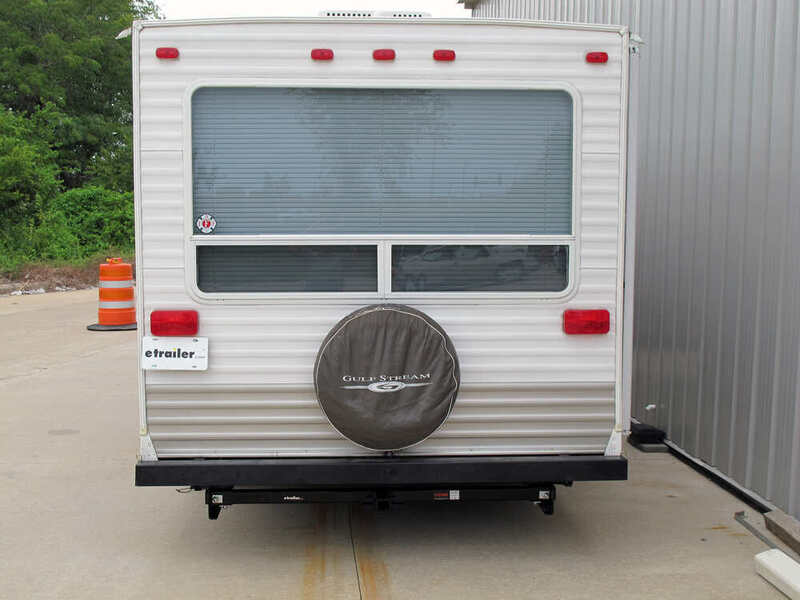 Given the bouncing that would be experienced at the rear of a towed camper, Id be leery of carrying a motorcycle on the rear of any towed trailer. 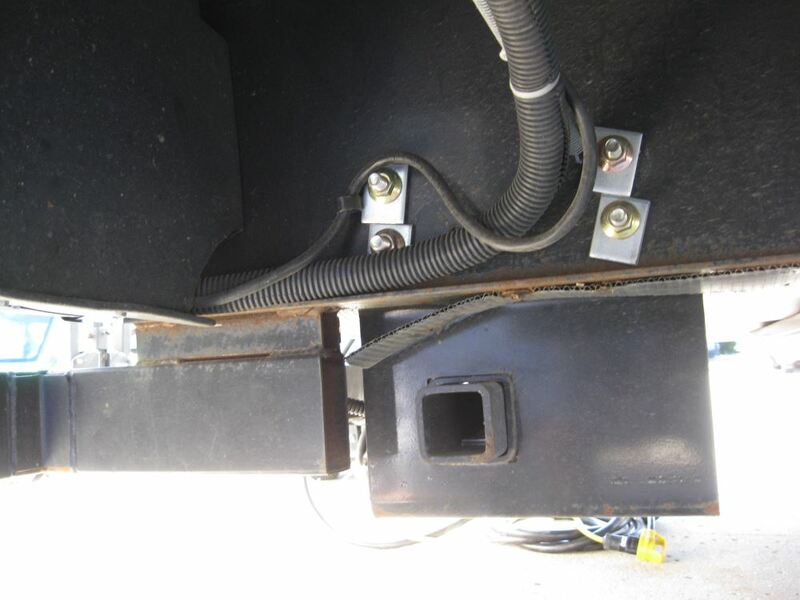 We do indeed offer some hitches that are designed to bolt to the frame of your travel trailer. 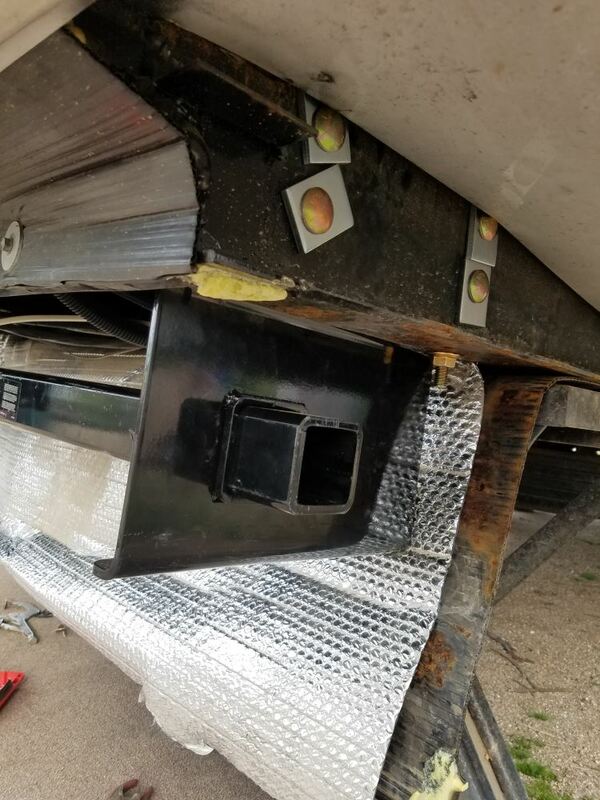 If the frame members on your travel trailer are between 18-51 inches apart, the Curt Hitch # C13701 would be an excellent choice, with it's tongue weight capacity of 500 lbs. 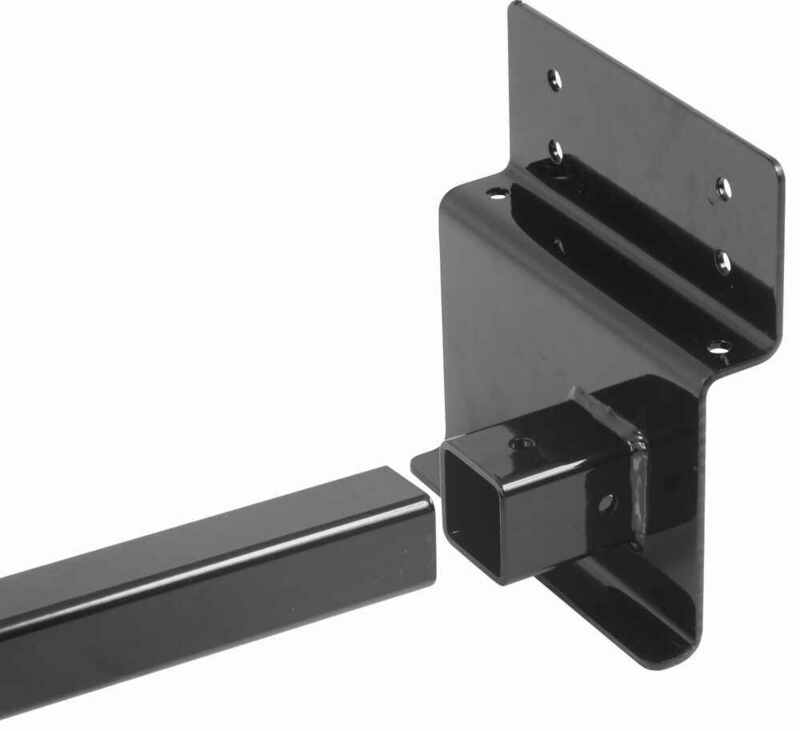 For frame members between 22-72 inches apart, use the Curt Hitch # 13703, which has a tongue weight capacity of 350 lbs. 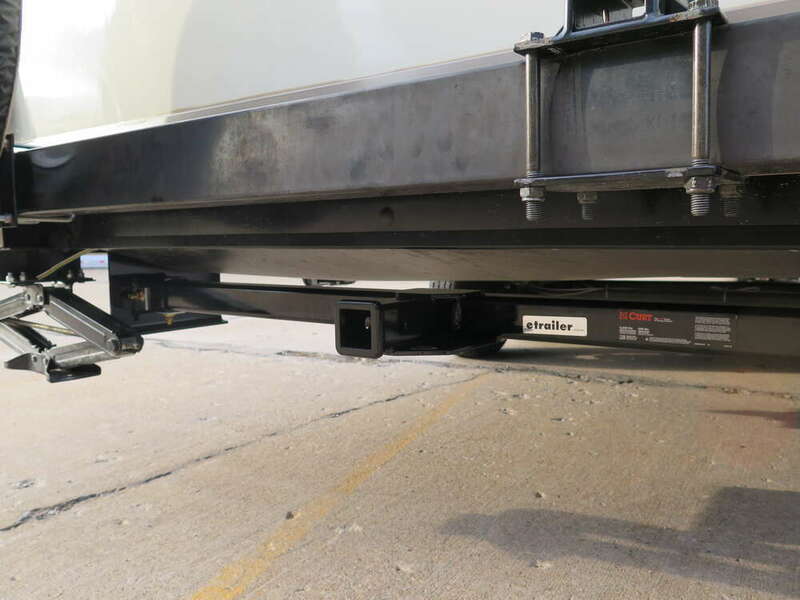 There is not a bumper mounted hitch for the size you referenced from any of our manufacturers. 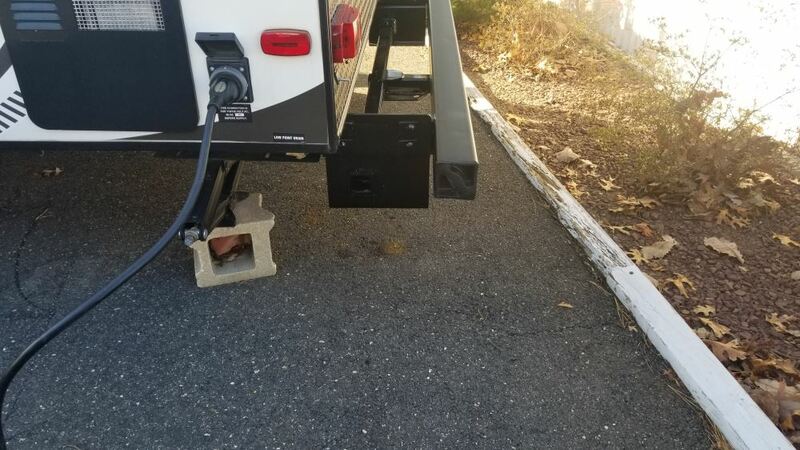 I do however have a trailer hitch receiver I recommend for your Gulfstream Vintage Cruiser 19ERD. 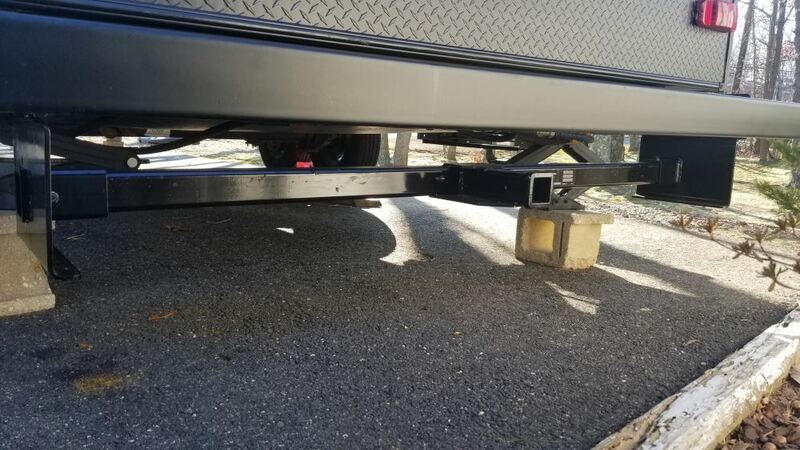 I recommend the Adjustable Width Trailer Hitch Receiver for RVs, 22" to 72" Wide # 13703. this bolt on or weld on trailer hitch receiver will mount to your trailer frame to give you the support you need and will fit just under your bumper. 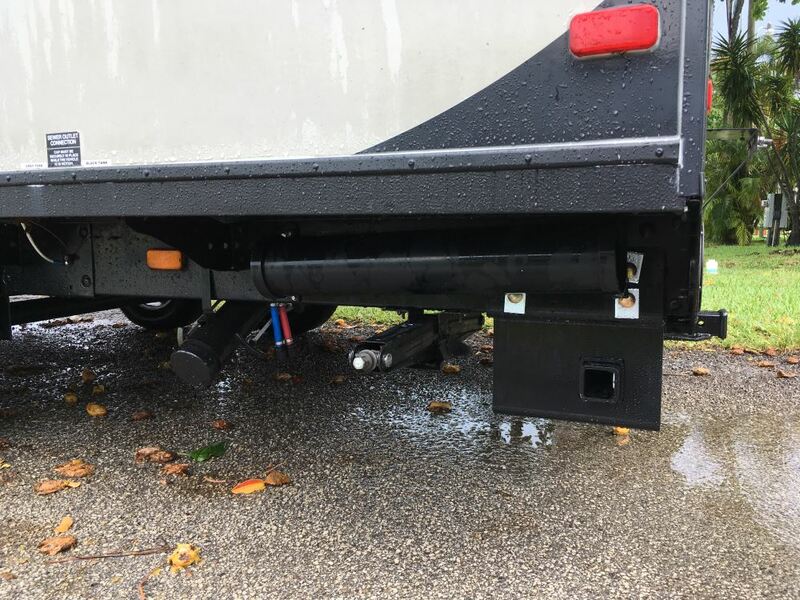 We don't have a custom fit trailer hitch for your Jayco trailer but the Curt hitch part # 13703 will be your best option. It fits trailer frames that are between 22 and 72 inches in width and can fit box frame, C-channel frame, or I-beam frames. I attached an install video for you to check out as well. Notes: Item has surface scratches, and some paint damage. All parts present and in working condition. Notes: Item is missing all hardware except for the 32 spacers. Part has surface scratches.